Q. Is there parking at the terminal? A. There are 10 free parking bays at the terminal and paid parking on Home Point Parade. Q. Do cruises operate in any weather? A. Our cruises are a fantastic option when inclement weather restricts outdoor activities. The vessel is heated in winter and cool in summer and covered. Q. Is smoking available on board? A. Only on the aft deck of Lady Launceston. Q. Can I bring food on board? 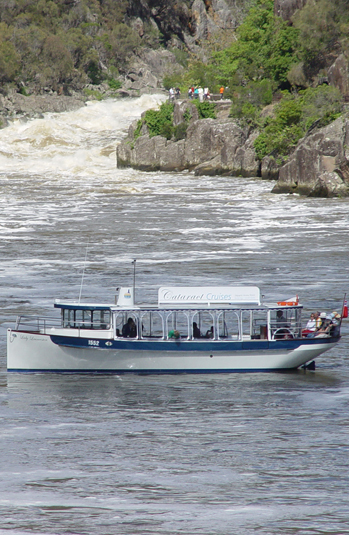 A. Snacks can be taken on our 50min Cataract Gorge Cruise. Q. Are there toilets on board? A. The Lady Launceston has a clean, accessible marine toilet. Q. Is the vessel wheel chair friendly? A. The vessel has wheel chair access. Some low based electric wheel chairs may have issues. Please let our kind staff know in advance and we will accommodate you any way we can. Q. Is seasickness a problem? A. Motion sickness is a rarity on the calm waters. Q. Can infants be taken on board?